A swimbait is a pretty easy bait to fish – you make long casts with it and just wind. Swimbait bites are one of those bites you have to be real patient with. You will feel them tap it. It’s almost like a worm bite. You’re just reeling that thing along, and you’ll feel it. Then when one bites it, until he loads up on your rod, you just can’t jerk. You’ll feel him pop it, but a lot of times, they’ll just pop it and then hit it again and get it. 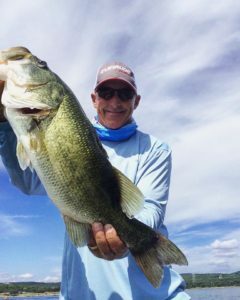 Swimbaits require a lot of patience and attention, but they are a great bait for catching big fish. Good luck out there!